The city of Hoboken, New Jersey experienced flooding as high as 9 feet above normal levels during 2012's Hurricane Sandy, which devastated the New York City metro area. 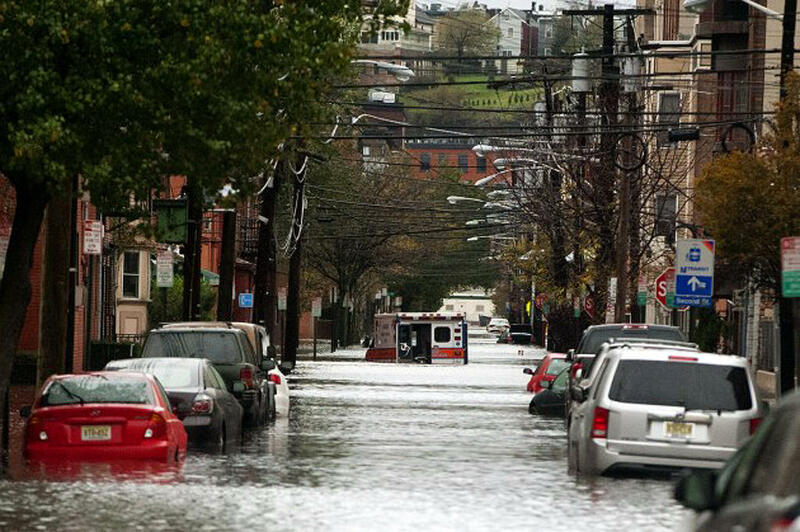 In 2012, the city of Hoboken, New Jersey experienced flooding in excess of 9 feet above normal levels. The city of 50,000 people, which sits just across the Hudson River from Manhattan, had sustained a nearly direct hit from a Category 3 hurricane. One source of flooding was a long-forgotten river, which had been paved over decades earlier. Michael Bruno witnessed the destruction from Hurricane Sandy first hand. He is now the Vice Chancellor for Research at the University of Hawaii, but in 2012 he was the head of the engineering department at the Stevens Institute of Technology in Hoboken. As the storm was closing in on New York City, Bruno received a call from Dawn Zimmer, the mayor of Hoboken. 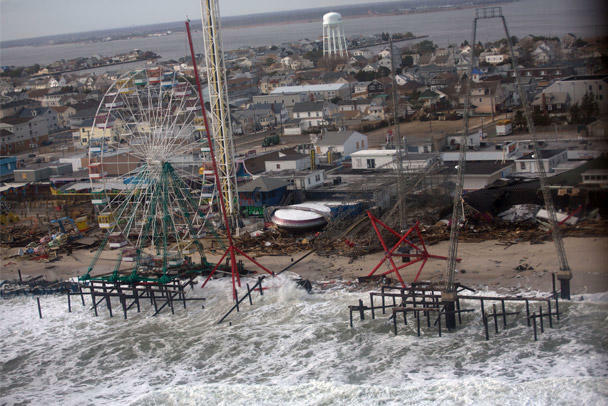 Coastal towns all along the Jersey Shore experienced heavy damage during Hurricane Sandy. Pictured here is Seaside Heights, NJ. Zimmer asked Bruno, who has a doctorate in civil and ocean engineering from MIT, to attend an emergency meeting of city officials. At that meeting Bruno gave his best estimate of what Hoboken would likely face as the storm made landfall. He predicted flooding on the order of 9 to 10 feet above normal levels for the riverfront city. A different city official interjected, telling the mayor she had nothing to worry about. The city’s Department of Public Works had recently installed pumps, which were in perfect working order. Looking back, that notion seemed almost laughable to Bruno. Communities in Hawaii have also experienced disasters being attributed to events related to climate change. 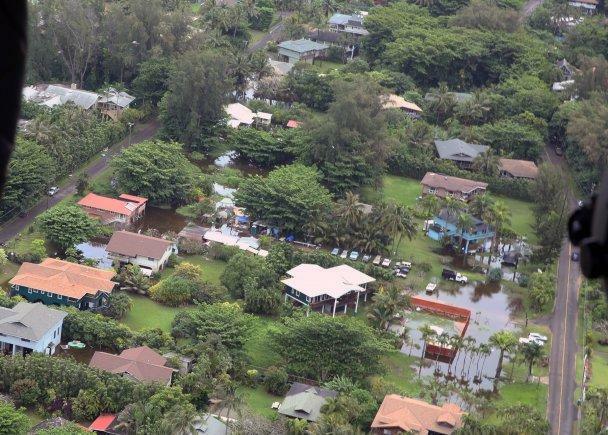 In 2018, a so-called "rain bomb" dumped 50 inches of rain on Hanalei in 24 hours. Although the damage in Hoboken was severe, many lives were saved as a result of preemptive action taken by city officials, who were spurred to action by Bruno's briefing before the storm. The city's example can serve as a lesson to other planners. In the aftermath of Hurricane Sandy, it became clear that an old riverbed, long since paved over, had provided a conduit for much of the floodwater that rushed into Hoboken. In Bruno’s view, those lessons can’t be learned soon enough. With the overwhelming scientific consensus that climate change is already impacting the planet, major cities have an ever-narrowing window to begin the costly and lengthy process of adapting. Bruno outlined that challenge in a book he co-wrote called The Urban Ocean: The Interaction of Cities and Water. But its more than just an engineering challenge. Climate change adaptation is what Bruno calls a “have or have not issue”, with the have-nots being the residents of less developed nations and small cities, whose governments cannot marshal the massive financial resources needed to harden existing infrastructure. 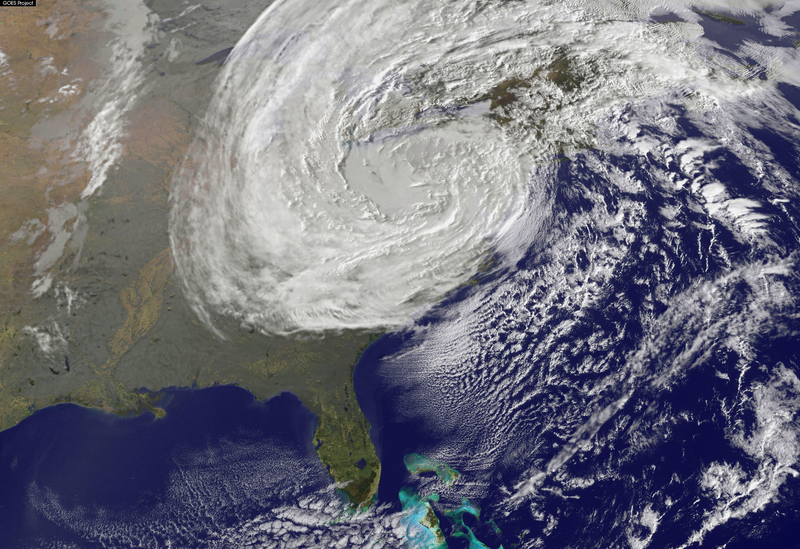 "Superstorm" Sandy affected much of the eastern seaboard in the 2012. Whether or not human society can adapt to the coming paradigm shift largely hinges upon time according to Bruno. If the pace of change is slow enough to allow policymakers and people to make the necessary changes, he thinks we have a good chance. But if the changing climate causes rapid disruption or destruction, the challenge will be much greater. Still, Bruno remained hopeful for the former outcome. Local and national experts on climate change are in Honolulu today to discuss the state’s response to climate change challenges. HPR Reporter Kuʻuwehi Hiraishi has this story.